3. See how you run. This is a no-brainer when it comes to picking out just about any type of shoe to wear (e.g. dress shoes, flats, sneakers, etc.). However, knowing your exact size for deciding which pair of running shoes to get is super important, as a too-large or too-small shoe can make or break your running experience, let alone be extremely uncomfortable to wear. To measure your shoe size, all you will need is a ruler (in inches) and a chart that corresponds to it. For a guideline of your foot’s measurements in regard to shoe size, check out this chart here: Measurement Tables for Shoe Sizes. As you look at the chart, you’ll see your exact shoe size. For instance, if your foot measures 10 inches, then in the U.S. it’s a size 8 for men and a size 6 for women; in Europe, that same measurement would be a shoe size of approximately 42 for adults. Once you figure out your shoe size, it’s a matter of selecting the best running shoe for it. However, when finding the right one, get them in an extra half-size larger (so for size 8, choose 8.5); this is to ensure that your toes in the front have space to breathe, as well as balance you while pounding on the pavement. Also make sure that your heel in the back is secured, to prevent the shoe from slipping off while exercising. For more information on this, check it out here. Middle arch: Considered the “ideal” foot type to have, a middle arch is essentially when the center of your feet has a moderate amount of pressure in relation to the heel and ball of the foot. Low arch: Also known as having “flat feet,” low arches refer to the pressure being distributed all over the foot. Having this type of feet shape can cause trouble to those who are often on their feet, from heel pain to injuries such as plantar fasciitis. If you’re unsure just what your foot type is, you can easily determine it by a self-diagnosed “wet foot test.” It’s simply a matter of dipping the bottom of your foot into water then pressing it down onto a paper towel and releasing it to see the imprint. If you notice that half of the arch is filled in, then you have a middle arch; those which are either entirely filled in or not at all are low and high arches, respectively. Pronation: Also called “neutral,” pronation is when your foot’s first strikes the outside corner of your heel, before rolling to the ball of the foot’s center when pushing off from the ground. This is the ideal style to have for effectively absorbing impact, as well as lessening pressure from joints and knees. Over-pronation: This type involves the foot striking the inside of your heel before rolling up to the inside corner of the ball of the foot. 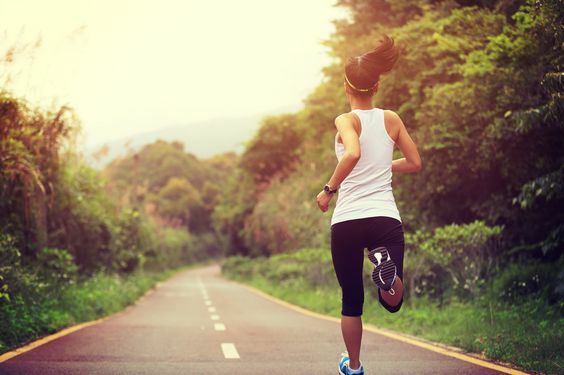 It’s an inward movement that puts runners at risk for pain and injury. Supination: Also known as “under-pronation,” supination is the opposite of over-pronation in that the foot’s heel strikes outwards before rolling outwards to the ball of the foot as well. In addition, it’s not just about how you run, but how often you do so: Are you a sprinter or a long distance runner? Do you run every day or a few times a week? Are you training for competition or just for recreational purposes? It is no doubt that, the more miles you run (as well as the more often you run), the faster your shoes will wear out and needto be replaced. The impact of pounding the pavement over time will wear down the shoe’s cushion, and so it’s necessary to get new pairs once the old ones have lost their support. On average, a pair of shoes should be replaced every 300 to 500 miles, or around three to five months; however, if you’re doing more than that, then you’ll need to switch them out more frequently. Don’t run the risk of getting an injury just because your running shoes have worn out; it’s better to pay for new shoes to protect yourself rather than choose to be cheap and get hurt. Do you tend to run on concrete sidewalks or on uneven surfaces like trails? While you might think that it doesn’t matter what kind of ground you often run on, it actually makes a difference when it comes to finding the best running shoe for extra cushion and support. For example, you might need more padding on your running shoes if you frequently run on concrete or trails. For other instances like sprinting or treadmill workouts, you might not need as much cushion, since you would need lighter shoes for improving speed or the machine is already designed to minimize impact from striking, respectively. For more information about this, check out this article here. If you often compete in races, then you’ll need to invest in something lighter than the typical running shoe: you’ll need racing flats, which are lightweight with almost no cushion, thereby used to enhance speed time without burden. On the other hand, if you tend to run for recreational purposes, then a standard cushioned running shoe is best for you, especially if you run long, slow distances and need some support for your feet. Road: Whether it’s asphalt or concrete, this is one of the most common surfaces for running, especially in neighborhoods and cities. Running shoes of this type are designed with cushion, but are lightweight in order to make turnovers quick when exercising on even, hard pavement. Trail: Since the ground is usually soft and less stable to run on, running shoes for trail workouts offer plenty of support and stability, as well as lots of traction to prevent slippages from happening. Cross train: This refers to activities like cross-training, or perhaps for treadmill workouts, which provide a controlled environment to practice running. Since the atmosphere is kept at a constant level, running shoes for these forms of exercise need less cushioning to do so. Looking for good running shoes? We have them! Here are our top picks the world’s leading brands for running shoes. ** Below, you'll see more detailed reviews, but you can also click the links above to see current prices and read customer's reviews on Amazon. 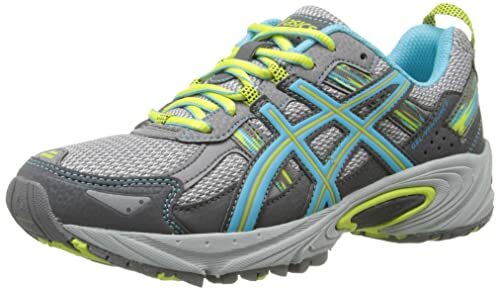 With a good fit for just about any foot size or shape, this particular ASICS running shoe brand prides itself in having good support and stability for runners to use on just about any type of terrain. Good for runners who suffer from injuries like plantar fasciitis or problems with fallen arches. Offers support for feet which tend to roll onto the lateral sides. Runs true to the runner’s shoe size (i.e. a size 7 foot is a size 7 shoe), thereby removing the guesswork for purchasing the item. Versatile to wear for runs, hikes, walks, and other activities like gardening. The toe box (space between the toe and front of the shoe) may not be big enough, which can cause the toes to be crushed against the front, leading to discomfort. More adapted for trail running and other tough terrains, but not necessarily for casual runs. Less padding around the opening of the shoe; this might irritate the heel and the ankle. Can be a bit bulky for running. While not necessarily the best choice to wear for long runs, this brand might be suitable for those who enjoy hiking or walking on uneven, rugged terrain. Made from a combination of synthetic and mesh material, Nike’s running shoe can offer runners plenty of comfort and padding while also good traction to keep the foot solid and balanced on the ground during runs. 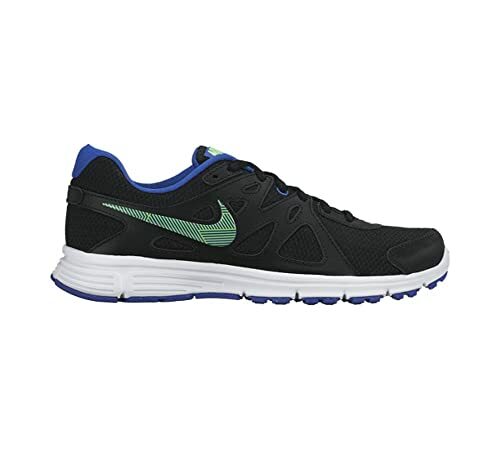 Contains a padded foot bed, and includes a Phylon midsole for comfort and support. Lightweight with well-designed streamlines for keeping every curve of the foot snug. Good for those with medium-gaited feet; offers plenty of balance for the foot type. No need to break them in upon first putting them on. Not as much arch support for those who either have high arches or flat feet. Size can run a bit small for different foot sizes. Durability of the shoe might not last long, thereby requiring the individual to purchase more pairs more frequently. Might not be the best choice for runners with wider, bigger feet, as they tend to be smaller and narrower in design. While perfect for runners with narrow feet and medium arches, this Nike brand might not be ideal for others with different foot shapes. 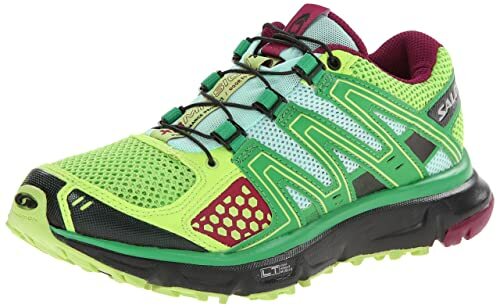 Vibrant and snug, Salomon’s running shoe is great for trail running, able to withstand just about anything while also being able to transition smoothly from trail to road in the ultimate running experience. Contains Sensifit and Sensiflex technology for a smoother running motion. Has a Contagrip function that helps retain sole traction for a better grip of the road. Faster and a more secured shoe lacing with the help of the Quicklace system. Washer-friendly for shoes that tend to get dirty on trail runs or other workouts. Might be good for running and walking, but not very versatile for other activities such as hiking. Does not contain the Ortholite sole, which can offer extra support for those with not-so-good arches. Quicklace system might not tighten the shoe laces well enough, thereby leading to shoe slippage when running. Can be a bit stiff and slightly too big for certain shoe sizes. Might not be the best for feet which tend to over-pronate. Salomon’s running shoe provides state-of-the-art foot technology for better running motion and traction. It works great for runners, but not as much for casual activities every day. Engineered with the newest Fresh Foam 1080 technology, this special New Balance brand gives runners a better touchdown-takeoff dynamic and a more flexible heel-to-toe transition, thereby providing a smoother running workout for everyone. Lightweight, but also with good cushioning. Consists of a data-drive midsole and outsole design, thus providing better support for different foot types. Natural breaking point during takeoffs, but also is stiff enough for reducing shock impact upon touching down. Does not need added arch support, as it’s already built into the shoe. Might have too much cushion in the heel and not enough support for the front of the foot, thereby can lead to pain in the ball of the foot. Can be quite clunky-looking and might impede movement because of it. Tends to slip off the heel, depending on the shoe size and your foot size. With the ideal combination of being lightweight and also having good cushioning for the foot, New Balance’s running shoe is a solid item to have for long, smooth runs. With its upper and expanding mechanics, the Reebok running shoe offers a streamlined running experience to help you push off from the pavement in an easy, smooth movement. Made from a combination of fabric and synthetic, this particular shoe brand provides comfort and convenience for the avid runner. Flexible and comfortable; the shoe also offers plenty of warmth and snugness during the cold winters. Consists of a mesh material to keep the feet cool and breathing even during the most strenuous workouts. Not only affordable, but also can help relieve back pain. Comes in a variety of bright colors to add some fun to your workouts. Lacing system isn’t very even, tending to pull at the middle rather than throughout the shoe itself. Can be a bit too wide for certain foot types. Arch support could use some improvement, as well as being more form-fitting. Rubber netting of the shoe can press on the pinky toe, which makes it uncomfortable sometimes. Although flexible and with a good takeoff-touchdown mechanism, Reebok’s lacing system can use some improvement, especially when it comes to securing the shoe well. As an avid runner, you are responsible for taking good care of your body not only in terms of fitness but also in your health (especially that of your feet). That’s why it’s crucial to choose the best running shoe based on your foot size, shape, and movement. By taking these into consideration, you can minimize injury while also enjoy doing the sport you love. Like this article? Feel free to share or comment!